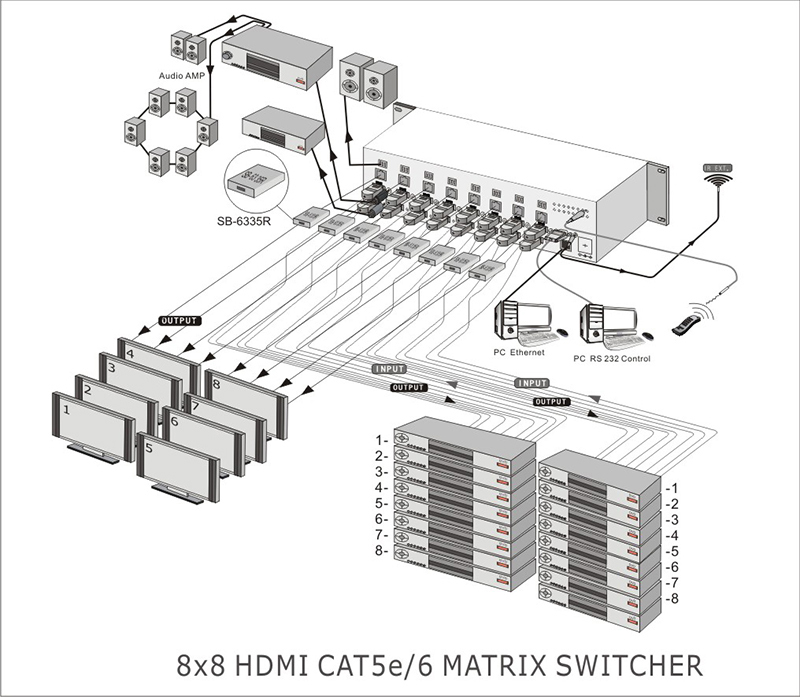 SB-5688CAP 8x8 HDMI & HDBaseT Matrix Switch with Auxiliary Audio I/O- SHINYBOW Technology Co., Ltd. 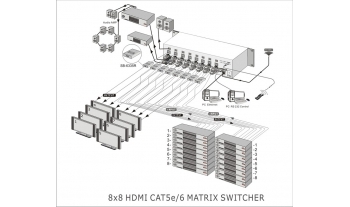 The SB-5688CAP is a professional 8x8 HDMI™ over HDBaseT™ Matrix Routing Switcher. Supporting (8)HDMI™ inputs and (8) Auxiliary Audio inputs. Output supported (8)HDMI™ outputs, (8)S/PDIF Audio and and (8) HDBaseT™ Transmitter with POH outputs(SB-5688CAP only). High definition digital signals can be selected and distributed to any (8)inputs to (16)outputs simultaneously(channel outputs mirrored). It is based on HDBaseT™ Standard and transmit HDMI™, Bidirectional IR and RS-232 and Ethernet signal up to 100M over a single CATx cable. 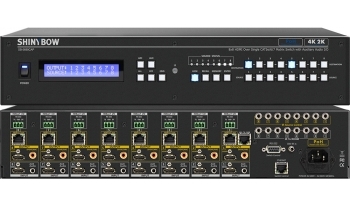 The switcher is supported HDMI™ 1.4a 3D formats and HDCP 1.3 compliant, data rate up to 6.75Gbps with signal bandwidth 340MHz. Supports wide range of HD resolutions from PC XGA to WUXGA 1920x1200 and HDTV/DTV HDMI™ resolution up to 4K2K 30Hz. The EDID management can be selected between seven(7) different modes. Control is provided via Front panel push buttons, IR remote, RS-232 pr TCP/IP(not a web-browser). An RS-232 Windows GUI interface is provided for matrix routing control(Windows only). 06. Digital Video TMDS formats Resolution up to 4K2K with Deep color 36-bit. HDBaseT Support bi-directional IR, RS-232, Multi format Audio, Ethernet and PoE.